Convened by the International Acupuncture Network. In March this year I was privileged to attend this excellent Japanese Acupuncture/Meridian Therapy workshop. Sadly, Masakazu Ikeda sensei was unable to present this year, as a result and at Ikeda sensei’s behest Edward Obaidey did his level best to fill sensei’s giant pair of shoes. For mine, Edward not only managed to convey the theory and practical skills but successfully conveyed the essence of Traditional Japanese Acupuncture and Moxibustion. No small achievement, I can assure you. Over the course of the three-day workshop Edward covered a myriad of topics related to the treatment of liver deficiency syndrome. In a clear and concise manner, using often humorous analogies Edward conveyed all of the necessary information with the humility and authority born of clinical experience. Personally, the 3 days were extremely beneficial and illuminating. However, it was the way in which Edward went about his work during the afternoon treatment demonstrations from which I drew the most inspiration! Whilst it was incredibly disappointing that Ikeda sensei was unable to be present, Edward delivered admirably and it was quite a treat when he called Ikeda sensei in Japan and as a group we were to be able to wish sensei the very best. In addition to the pleasure of seeing Edward for the first time in six years, I was delighted to catch up with many of my old friends and colleagues. The expression on Elizabeth and KC’s faces when they spied me on first day was priceless. Sitting with Adam and Byron, looking around at many familiar smiling faces I realized how comfortable I felt to be with my North American colleagues. It felt like days rather than years since we had hung out together. I had a wonderful stay in San Francisco sharing some memorable moments with Adam as we traveled around this fascinating city visiting his friends and celebrating life in general. Today as I write this report from Rainbow Bay, Queensland, Australia on an absolutely brilliant autumn day I am enormously grateful to be a practitioner of this amazing healing art. Surely I am blessed to have met so many extraordinary souls on my World Acupuncture journey. To my colleagues/friends in the states, thank you for making me feel so welcome. To Edward, mate your feet are growing rapidly, domo arigato! To Noriko, Linda and the International Acupuncture Network crew, great workshop superbly organized, many thanks. To Ikeda sensei, a huge thank you for sharing your amazing knowledge and experience with us, I remain grateful and continue to be inspired by your commitment and dedication. I hope this blogpost might inspire many more readers to dig deeper into this master practitioner’s published works and given the opportunity, attend his next workshop. 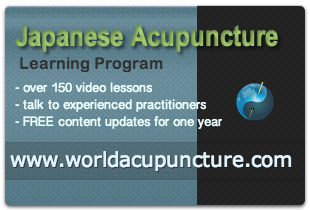 Alan Jansson is an internationally recognized teacher and practitioner of Traditional Japanese Acupuncture. For 17 years, independent of and in conjunction with Masakazu Ikeda sensei and Edward Obaidey, Alan has presented, convened and hosted more than 50 Japanese Acupuncture workshops in Australia, New Zealand, USA and the Czech Republic. Driven by a strong desire to promote the consumer friendly nature, clinical efficacy and potency of Meridian Based Japanese Acupuncture, Alan is a staunch advocate of practically based workshops and draws upon his 28 years clinical experience and 17 years post and undergraduate teaching in a concerted effort to lift the bar globally in the clinical application of this most amazing medical art. Alan Jansson is an internationally recognized teacher and practitioner of Traditional Japanese Acupuncture. As a staunch advocate of practically based workshops, Alan draws upon his 35 years clinical experience and 23 years post and undergraduate teaching. Alan has presented, convened and hosted more than 70 Traditional Japanese Acupuncture workshops in Australia, Europe, and USA. This looked like a really great experience and probably really informative, considering most people probably don’t know about the benefits of Acupuncture for liver deficiency syndrome! Indeed it was quite an inspirational workshop Chloe. We are hoping Ikeda sensei can make it next year.